The rain is moving northwest. 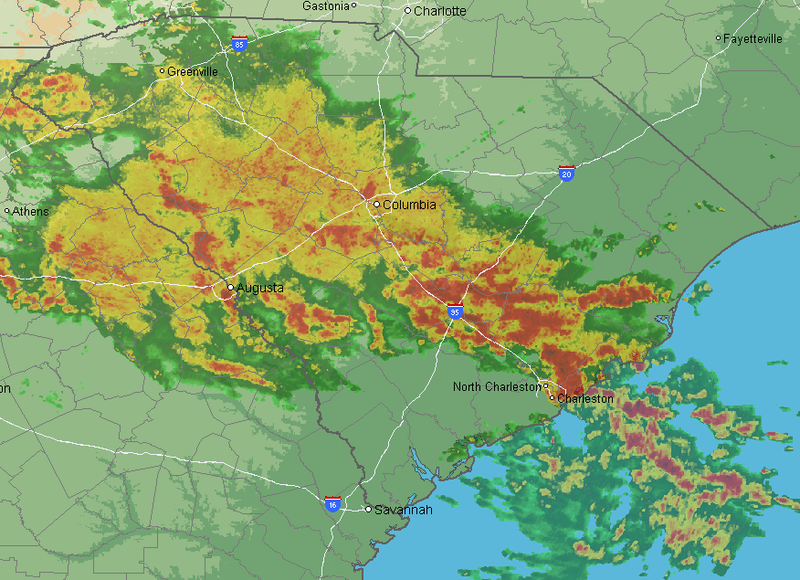 Yellow = heavy rain. Red = torrential falling rain. Here is a different computer forecast than the ones I have been showing earlier today. This rainfall forecast is valid from now until 11am EDT Sunday -- and it forecasts unbelievable amounts of rain considering what has already fallen. 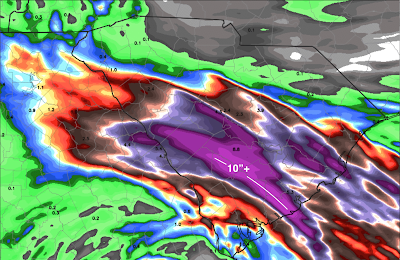 The model forecasts an additional 8.8 inches at the Columbia, SC airport during this period. I have adjusted the color of the band of 10"+ amounts and the model says a couple of spots in that band may have another 15 to 18 inches -- again, on top of what has already fallen!! Catastrophic flooding is going to result. I know it is late on a Saturday evening. However, I want to stress that if you are on high ground, do not travel. The situation is going to worsen during the night and Sunday as major rivers start to rise. Before this is over, I expect that even interstate highways are going be washed out!